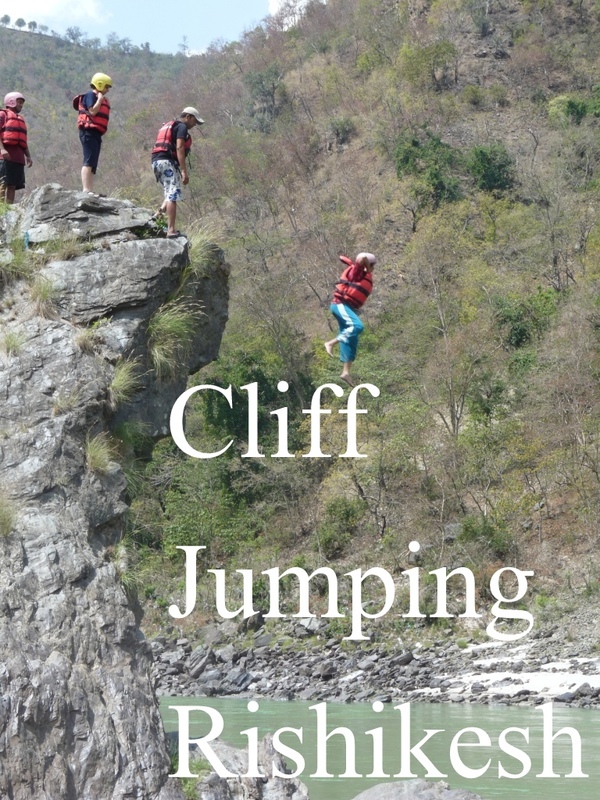 Cliff Jumping- Now Why did I do That? 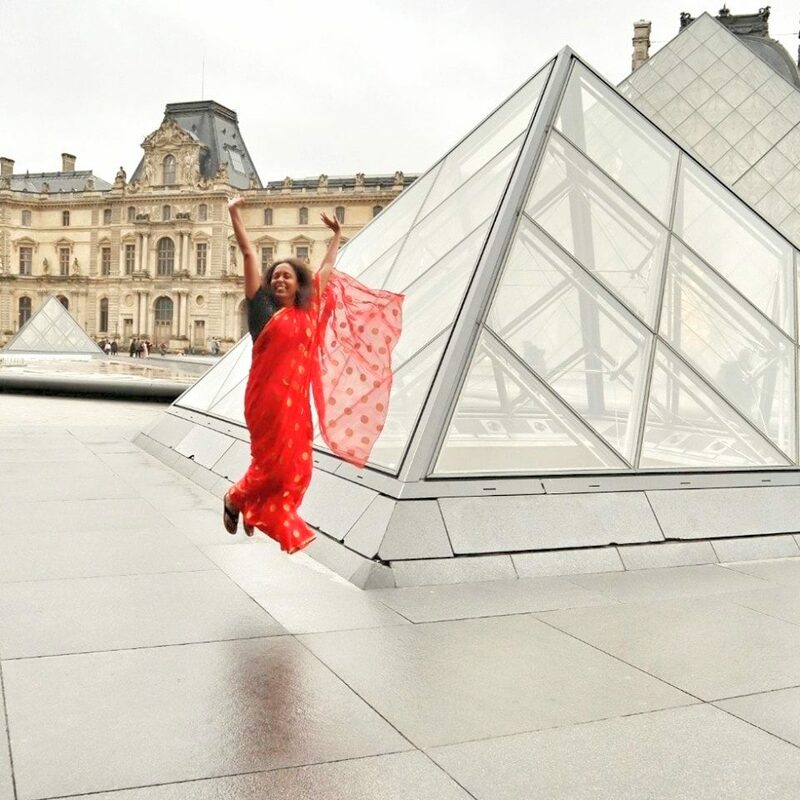 When I showed this picture to a friend, he asked, “So did you go down screaming?” To my “no” he added, “I would, because what if that was the last thing I did in life!” I had no such thoughts when I took off that ledge. But the question remains, why did I do it? I obviously have no clear answers. By my day job I am an Associate Professor and people usually do not associate their teachers with adventure travel. I have to admit I do not go out seeking adventures, they just find me! I was originally not scheduled to go on this trip but at the last moment I had to replace someone! I am not complaining though. 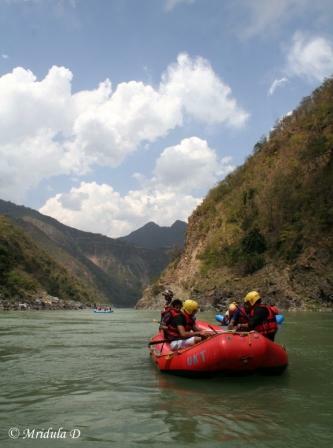 It was a rafting trip to Kaudiyala in Uttarakhand. On day one we did the gentle stretch between Devprayag and Kaudiyala. 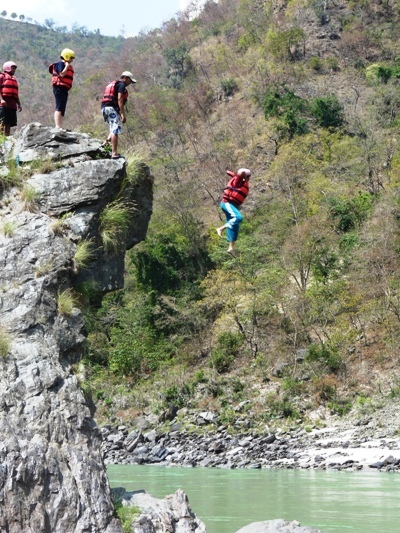 At mid point the organizers (Rimo Expeditions) asked if we would like to do cliff jumping and a lot of us were game. I still remember very clearly how it felt standing there. In the picture it may not seem very steep but to me who was standing on the edge it looked very high! There were a few who actually walked back from the edge. So when I stood there the person in charge (the first person standing on the ledge towards the water) Gunpalji asked if I really wanted to do it? When I firmly said yes, he asked me to hold the straps of the life jacket or else my hands would hurt when I fell in the water. With a gentle nudge from him I was on my way! It was all over in a few seconds but for the deeply itched memories! You see, this was a college trip and I was one of the members of the academic staff on this trip! Many thanks to one of my students who clicked this picture and shared it with me. For more beautiful images of the Sky please visit the Skywatch page.